The Irish love their sports and their holidays, and if it’s one thing they know- it’s how to celebrate with good food. 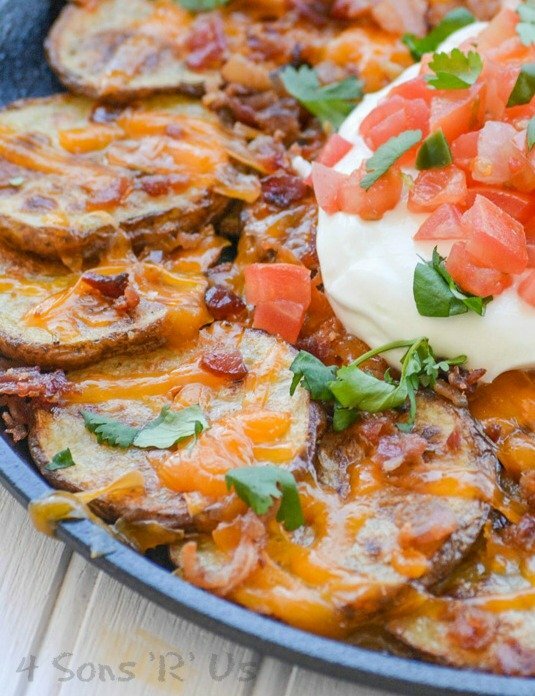 You’re going to want these quick and easy, totally delectable Irish Pub Nachos at your next party. Do you ever have that funny moment where you don’t know what to say, or to talk about. Happens to me allll the time. Especially when it’s time to sit down in front of my computer and get serious about getting a post and recipe written out. Luckily, there’s this thing called ‘notes’ on my cellular device. Where I can actually make just that, notes, of what I want to talk about, discuss, or look up at a later date. And it’s quite a long list, annotated even. Every bright idea I have, every change I want to make. Every limb I want to go out on in my kitchen– they’re all there. While you’re probably curious, the list’s top secret. Cant show you, even though I really wanna. I’ve gotta save that ‘mmphh’ factor for the recipe debut here on the blog. That way when it finally lands here, I’ve ironed out all the kinks and just give you the perfect finished product. Something that just goes BOOM. Mic Drop. After telling you about all this, you’d probably think I’d have everything worked out organized, and ready ahead of time. Hahahahahahahaha. Did I mention I have four kids AND a husband? So naturally, I ran into two problems at the beginning of this week. One, I needed to come up with something for March 17th. Two, once I had I could NOT wait until the holiday to show these bad boys off. Luckily, I made several notes about this idea I had for Irish Pub Nachos. That part, the making of them, the photographing, the devouring– all went swimmingly. As for wanting to shove a giant platter of them through my screen to your table STAT? Well, refer back to my earlier footnote about kids. Life happened, so in true better late than never fashion, let me introduce you to our Irish Pub Nachos on St. Paddy’s Day. They’re a perfect way to celebrate. Thinly sliced russet potatoes are tossed in traditional Irish seasonings before being baked to crisp, yet tender perfection. 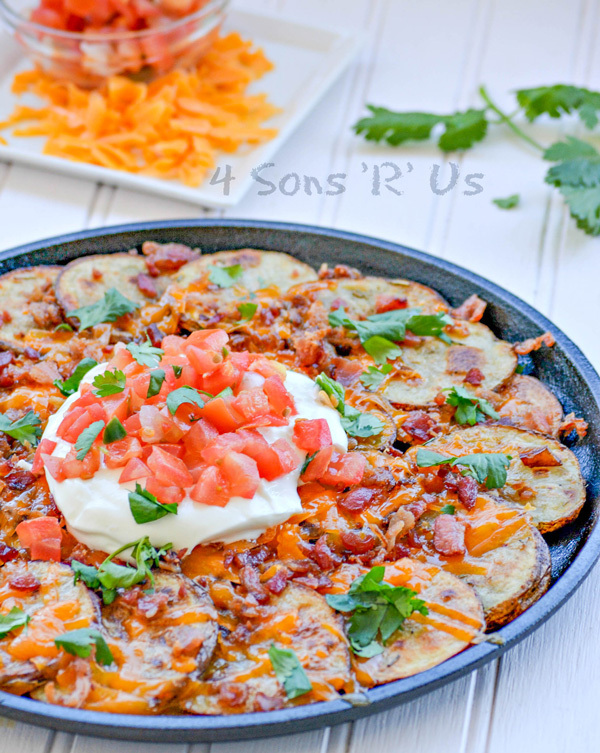 Liberally topped with cheddar cheese, crumbled bacon, sour cream, pico de gallo, and cilantro- dig on in. Irish Pub Nachos are pure comfort food. They’re the perfect way to celebrate St. Paddy’s Day, wherever you are on the globe. You can enjoy them any day for an easy lunch, or a perfect appetizer to share with a friend. For a more authentic feel, serve them on game day while watching the European Cup. For other Irish inspired recipes, don’t forget to check out this rich & creamy Irish Colcannon Potato Soup, this new twist on the classic deviled egg, a traditional Irish Soda Bread, or for a fun dessert the kids will love Irish Potato Candy. 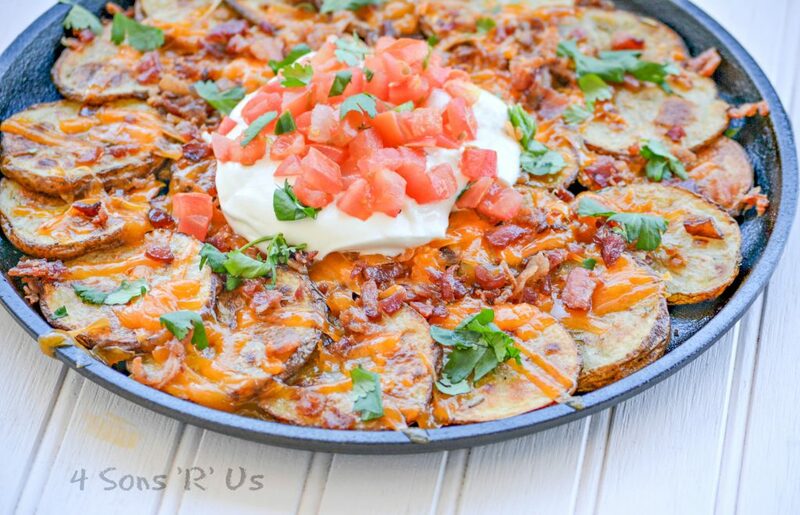 These potato based nachos feature some of your favorite toppings, making them perfect for sharing at any get together or game day. Make sure you've washed and scrubbed your potatoes. Use a clean dish towel to dry up any of the excess moisture. Use a sharp knife to slice them into 1/4 inch thick coins. Add the potatoes to a large mixing bowl. Drizzle them with olive oil. Add in the seasonings--rosemary, thyme, salt, and pepper. Use a spatula to toss them to coat, gently but until all the spices and oil are evenly covering all the potatoes. 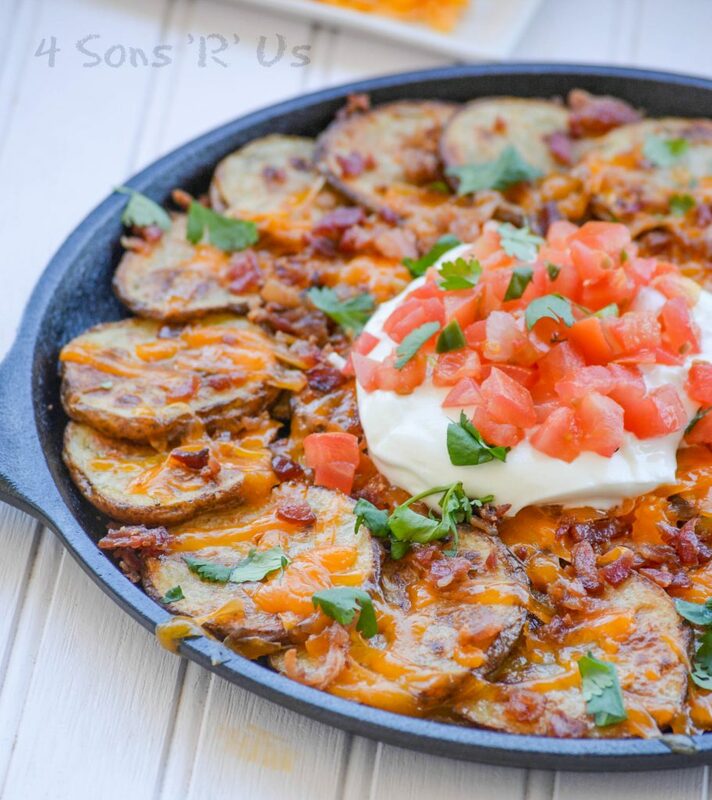 On a large, rimmed baking sheet place the potatoes out in an even, single layer. Drizzle any remnants from the bowl evenly out over top. Bake the potatoes at 450 degrees for 20 minutes, flip the potatoes oven, and then return them to the oven to bake for a final 20 minutes. Let the potatoes cool just enough to safely handle. Transfer them to a flat cast iron pan, with the edges slightly overlapping in a spiral pattern. Spread the cheese and bacon out evenly over top. Bake another 4 minutes, or until the cheese is melted. Remove the skillet from the oven and let the potatoes rest for a minute. Serve these nachos with a scoop of sour cream in the center, a dollop of pico, and with green onions or cilantro sprinkled over top. Love Irish Nachos! Pinned it to make later! 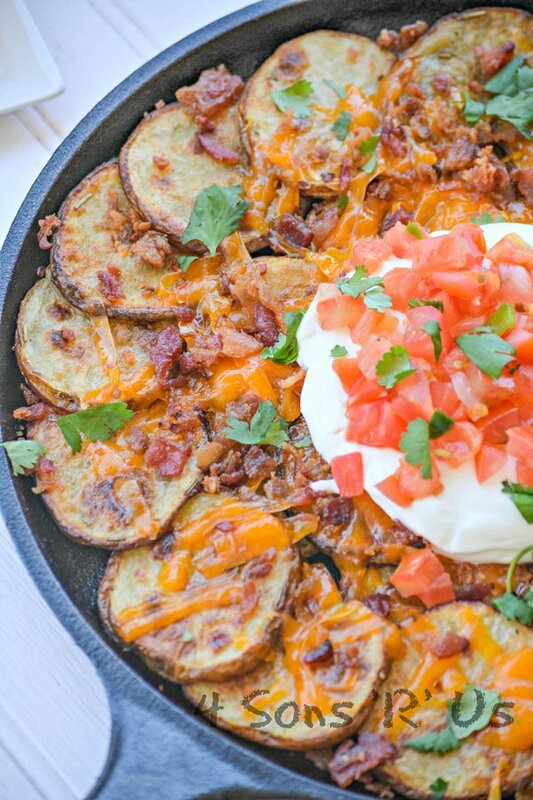 This Irish Pub Nachos sounds and looks so good! I think I would not miss the tortilla chips when I have this in front of me. Besides, I love potatoes a lot. Thanks for sharing at this week’s FF table. Have a lovely weekend! Yummy! Okay, I will just be over for dinner, between the cheesecake and the nachos …can’t go wrong! Hi! I’m super excited to make these… just wondering if you have ever made them ahead, as to bring them to a party? Thanks! I haven’t Hilary. Kinda like French Fries that you make ahead or leave sitting out, you’d run the risk of them becoming stale or soggy. I couldn’t agree more, Dana. So happy to hear you loved them as much as we did! These were amazing! My family gobbled them up and demanded I make them again soon! For St. Patrick’s Day, what if I were to sprinkle some corned beef pieces as well? Any thoughts? We can our own and it is beyond delicious. I just may try it! Oh that’s a great idea! I’d try it and see 🙂 Can’t go wrong with corned beef on St. Paddy’s Day. Have you ever used just a baking sheet to finish them? I don’t have a flat cast iron pan unfortunately. You could use that or a regular cast iron skillet, if you prefer 🙂 The skillets just keep everything together and heat evenly, which is why I like them. Is a cast iron pan mandatory? I was going to use a pizza pan. A pizza pan will work just fine. I just like the cast iron pan because you don’t get any spreading, and everything heats evenly. It will still turn out delicious on any pan though- promise! I have made these several times for my boys and we love them. Thank you for sharing this. So glad you love them, Danielle!! In the oven now and they smell AMAZING! I’m lazy and don’t want to dirty a 2nd pan so I’m going to try arranging them on the baking sheet and hope for the best! Can’t go wrong with potatoes cheese and bacon! A+++ These are soo good. I didn’t have pico de gallo so I used diced tomato and onion. We really enjoyed these. I’ll be making these often.